Five-year-old Charli’s eyes widened as a group of Randolph students carried his homemade Halloween costume into the gymnasium. As they placed the Mario Kart-themed contraption over his wheelchair and helped him put on the signature red hat and mustache, he grinned from ear to ear. Thanks to members of Randolph’s Society of Physics Students (SPS), Charli, who was born without hands or feet, would be able to trick-or-treat this year with the costume of his dreams. The project was part of the Children’s Assistive Technology Service (CATS) inaugural Hallowheels fundraiser. Based in Roanoke, the volunteer-run nonprofit serves as a no-cost resource to children with disabilities who need adaptive equipment and whose families have limited resources. Six teams competed to make a Halloween costume using wheeled mobility. The idea, according to organizers, was to make the wheelchairs an asset rather than a liability. 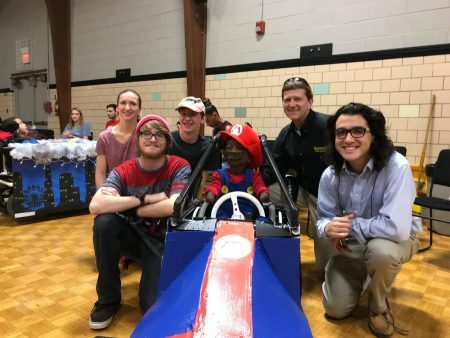 Randolph students spent several weeks building the costume, even adding details like a programmed microprocessor that played the Mario theme song and lit up LEDs in the shape of an M on front of the cart. Brendan Wicker ’21, one of the students who worked on the costume, called Hallowheels an amazing experience. Randolph’s SPS is well known for its community outreach efforts. The group organizes the College’s Annual Science Festival and has been recognized by the national SPS organization as an Outstanding Chapter for 10 straight years. In October, the group received the prestigious Blake Lilly Prize, which is given to SPS chapters and individuals who make a genuine effort to positively influence the attitudes of school children and the general public about physics. “The engineering and SPS students try to build a lot of things each year, but this was totally different,” Sheldon said. “We were building something for somebody who it really meant a lot to. When we gave it to him, everyone was applauding, and Charli was so proud. It really did bring tears to my eyes, and I think everybody else felt the same.